KoopaTV: Ludwig Got a Nintendo Switch! Impressions Inside?! Ludwig Got a Nintendo Switch! Impressions Inside?! By LUDWIG VON KOOPA - ...KoopaTV is saved! We can be a real Nintendo site now! It only took four months, but I am now an owner of the Nintendo Switch. To be exact, the grey one, not this neon stuff. More on how I acquired it tomorrow. What's important now are my first impressions. The Nintendo Switch and the Joy-Con feel very delicate. I don't know how they expect us to treat it like a portable system. You can't fit it in your pocket or anything. If you put it in your bag it'll probably snap apart somehow. That said, I have no problems snapping the Joy-Con to the Switch. Anyway, I eventually (after, what, half an hour?) just force-quit the preparation paralysis and restarted it. Then everything worked just fine and it asked me to perform a painless system update. Now, in terms of the Dock... You have to open the back of it to put the HDMI cable and AC Adapter in. Unlike the Wii U, you only need one electrical outlet to charge and power all components. While it has these wires with the back opened, the Dock is not sturdy at all, and one small touch will cause it (and any Switches inside) to fall down. That said, I feel like every time I put the Switch in the Dock, I'm going to break something. 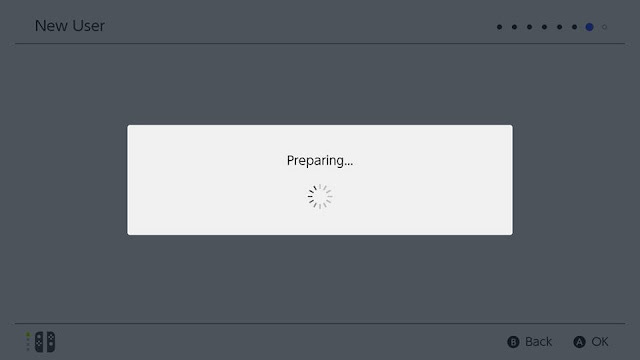 Also, annoyingly, you can't turn off the Switch while it's in the Dock, unless you force-quit it. I assume if you keep force-quitting consoles, it'll have an effect like prolonged exposure to Phazon. ...In other words, it'll probably screw you up permanently (or outright kill you). I did not get any games when I got the Nintendo Switch, making this the first Nintendo console in a very long time to not have anything packaged with it. The Wii U had Nintendo Land, while the Wii had Wii Sports. The Nintendo GameCube always had many bundles. Etcetera. The closest thing is the demo for Blaster Master Zero, which is a good demo, by the way. Speaking of the Dock, the Joy-Con Grip that the Nintendo Switch comes with is a total disaster. It feels like garbage. It doesn't have any added functionality or anything — it's just an uncomfortable plastic mold that holds the left and right Joy-Con in place. Rawk warned me that the Joy-Con Grip would be bad, but I thought he was just exaggerating, like he is about the 3DS making the resolution of backwards-compatible DS games unplayable. (Note that the lack of backwards-compatibility on the Nintendo Switch is also a reason why there isn't much to do with it immediately.) It's because of that that Rawk is only going to get Apollo Justice: Ace Attorney on a tablet instead of buying the Nintendo DS card. Before you ask: I haven't played The Legend of Zelda: Breath of the Wild yet. The Joy-Con Grip is being demoted to another hat. The Nintendo Switch Pro Controller is VERY comfortable. It's also very expensive ($70), but so far, it's compatible with everything that it needs to be. There is a chance that developers will stop making it compatible with things, but they... better not. You can even use it when the Nintendo Switch is in tabletop mode if you're willing to take it with you. It also recharges through the Dock and has a very long battery life. Nintendo hasn't made a controller this good since 2001! It's mandatory if you are going to play the Nintendo Switch outside of portable mode, because that Joy-Con Grip is seriously a disaster. KoopaTV acknowledges that it didn't do wall-to-THE-WALL coverage of the Nintendo Switch when it launched. We're still not going to make up for that. I mean... unless you really want it four months after-the-fact. We clearly have no idea how to handle new product launches! By the way, Best Buy reminded me that the New Nintendo 2DS XL is launching at the end of the month. I forgot it existed, personally. Also, there were no actual Nintendo Switch systems in-stock at Best Buy. 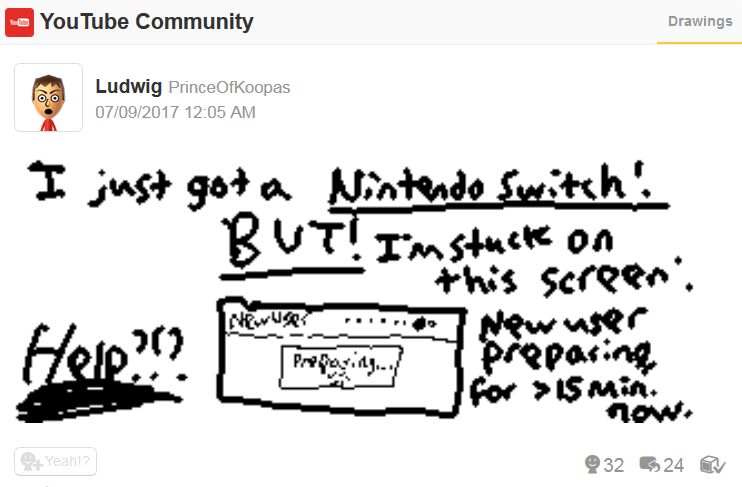 If you still need to acquire a Nintendo Switch, wait for KoopaTV to reveal a new feature tomorrow! 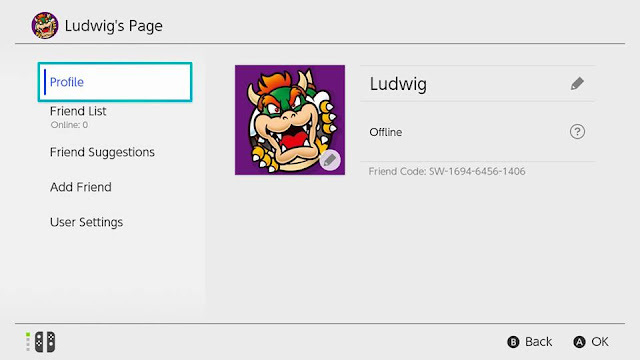 If you want to send Ludwig a Switch friend request, his friend code is SW-1694-6456-1406. Why are friend codes back? Who knows. Ludwig also bought another $10 Nintendo eShop card while at Best Buy, for the sole purpose of giving it back to you, KoopaTV's loyal readers! Check out the details of the KoopaTV Loyalty Rewards Program here! Remember: It's free to enter, AND free to win. You just need to be loyal to the site, so give your comments to this article! Confused about the parts of the Nintendo Switch? The informational diagram made when it was revealed still holds true to this day. For an explanation of why Ludwig (or Plushwig) has a Jigglypuff on his head, you'll want to read this article. Ludwig did do a lame unboxing video before, but for a game. Tomorrow is today: How Ludwig got the Nintendo Switch. Ludwig tries an ice cream cover for a hat next. Ludwig wants to make sure everyone knows that the Nintendo Switch Pro Controller should be made compatible with every game on the console. I found out you need the Switch on sleep mode if you want to charge the controllers. Yet the best way to solve all your internet problems if it refuses to connect to the internet is to force shut it down. There seems to be an advantage to sleep mode all the time with Splatoon 2. If you never exit the game but put the Switch in Sleep mode while the game is running, you barely have to go through Off the Hook announcements except for when Salmon Run is on. But... I need to watch the Off the Hook announcements to get a better feel for the new characters! Also, I reaaaaally like Marina's turntable skills with the background music and stuff. I ended up picking up my Wii U when the Wind Waker bundle was released and the price was dropped to $250. Based on how well the Switch is selling, I cannot see a price drop occurring anytime soon. I'm fine with paying more to support the company but the availability is the prime reason I have not picked one up yet. I don't think my town has ever recieved any shipments since the console's launch. Plus, by the time I see it has gone on sale online, they have already sold out. One of these days I will finally get one though. Well, no one's talkin' 'bout a price drop for the Switch. I'd rather have a price increase for the thing on the MSRP, because the ones making more money right now ain't Nintendo, but the sellers/scalpers. ...Nintendo is making its money on selling Pro Controllers. I was wondering where you were. You... literally disappeared from KoopaTV all of a sudden for over a month and it made me UPSET that I'd never see you again. You missed E3! I think I'll get Splatoon 2 sometime soon. It needs to come out first, of course. I don't actually have time to play both Breath of the Wild AND Splatoon 2 AND run this site. Hell, it might even be a "Pick 1" situation. ...Yeah, you can't obtain a Switch by just walking in. "Also, annoyingly, you can't turn off the Switch while it's in the Dock, unless you force-quit it." Force quit is holding it down for a long time. Turning it off means you need to select the option. But you can't do that for some reason because the power button is on the Switch and the Switch is in the Dock and it didn't care for my button-pushes. I pressed the power button while the Switch was in the dock, and it listened to me. I did have to hold it down, but then it brought up the power options. Yes, I think so. I'll try it again tomorrow to make sure. I'll try it whenever I next play the Switch, which is Saturday at the latest. Yes, when I hold down the power button while it's docked, a Power Options choice appears on the TV, which lets me turn it off. Yes, I can get the choice on the TV. HOWEVER, I cannot use the Joy-Cons, while attached to the Switch while in the Dock, to select the option I want. The buttons/sticks do nothing.